In September 2015 the project held an international symposium in conjunction with the ARC Centre of Excellence for the History of Emotions. The history of marriage and cohabitation has once more come under scrutiny as historians seek to provide context around the contemporary decline in modern marriage rates, the increase in divorce and the expanding number of children born out of legal wedlock. As new forms of intimacy are scrutinised for their impact on marriage and relationship stability, historians have also turned their focus to what people felt in the past and how emotions shaped and were shaped by human relationships. This Symposium considered intimate relationships, courtship, marriage and marriage breakdown from the early modern period through to the present, exploring the interactions between institutions and emotion, structures and social practice. Supported by the AHRC and the Economic History Society. ‘Beyond Tradition? 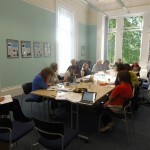 Non-traditional marriage, partnerships and family in Scotland: past and present’, took place at the University of Glasgow on the 6th of May 2014. The programme for the workshop can be found here: Beyond Tradition Programme. Read some reflections on the day here. The first year of the project has been very productive. We have almost completed census data sets for Govan, Kilmarnock, rural Aberdeenshire and the Western Isles for the census years, 1861,1881, and 1911. In addition we have poor law records for Kilmarnock and Govan from 1881 until 1939. This provides us with a good picture of family structure and diversity across these regions and we have presented these findings to a number of different audiences (see list of conferences and seminars below). Work has also begun on courtship. We are compiling illegitimacy statistics and prenuptial conceptions across the districts with a view to writing a paper on trends of premarital sexual activity and comparing past and present attitudes. We are also looking at classified adverts and breach of promise cases to gain insights into what qualities were valued when people were looking for a partner. Popular songs, broadsheets and letters are other sources that we intend to trawl to get some idea of changing (or not) views of the factors influencing the choice of marriage partner. A good deal of our focus this year has been on non-traditional marriages (irregular marriages), cohabitation and bigamy and this has yielded a good deal of information about the flexibility of attitudes to these in the past on the part of both ordinary people and, to some extent, official opinion. We have also been researching marriage breakdown in its multiple forms, including separation, divorce and desertion. The incidence of the latter was particularly high in a time when official separation and divorce were still difficult to obtain. Given the impending hundred year anniversary of World War One, we have been looking at the impact of the war on women and families. This has been a relatively neglected topic given the concentration on either military historiography, the economic impact of the War and, particularly in Scotland, industrial relations. We are presenting papers on this topic to a number of conferences and will publish an article in a learned journal. We organised a second Public Engagement Workshop on non-traditional partnerships and families, past and present held in May 2014, in conjunction with the Centre for Gender History and with support from the Economic History Society. Read a report about the day here. Podcasts from the day will be available soon on this website. We organised a Public Engagement Workshop, co-hosted with Scottish Women’s Aid: Learning From The Past, Looking To the Future, March 2012. This was attended by over 70 people drawn from a range of third sector organisations, social work practitioners and academics. A podcast of the presentations is available on our website. Jeff Meek , “The ‘Stranger’ Amongst Us: Boarders and Lodgers within Working-Class Households in early twentieth-century Scotland”, at the European Social Science History Conference 2014, Vienna, April 2014. Annmarie Hughes and Jeff Meek, ‘World War I, family breakdown and social regulation in Scotland’, Centre for Gender History, University of Glasgow, March 2014. Eleanor Gordon, ‘Irregular Marriage: Official Attitudes and Popular Practice’, Gender History Network Seminar Series, University of Edinburgh, September, 2013. Eleanor Gordon, Rosemary Elliot, Annmarie Hughes & Jeff Meek, ‘World War 1 and its impact on marriage and the family: Scotland’, Panel presentation, The International Federation for Research in Women’s History, Sheffield, April 2013. Eleanor Gordon, ‘Irregular Marriage: Myth and Reality’, Economic and Social History seminar, January 2013. Eleanor Gordon, ‘Working-class family structures in Scotland 1880-1939, North American Social Science History Conference, November 2012, Vancouver. 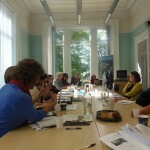 Eleanor Gordon, ‘Irregular Marriage in Scotland’, The Centre for Gender History, University of Glasgow, August, 2012. Annmarie Hughes and Jeff Meek, ‘State Regulation, Family Breakdown and Lone Motherhood: The hidden cost of the Great War in Scotland’, to be submitted to a journal. We held a Public Engagement Workshop in May on non-traditional partnerships and families. Full details are available here. An International colloquium will be organized later in the year on The History of the Family in Europe. A summary of the project’s media activity may be viewed on the new Media page.